Crusell’s Chamber music is interesting, in that, he, quite correctly, treated all of the instruments relatively equally. 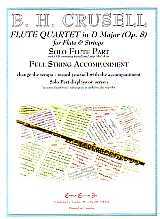 Crusell based Flute Quartet in D Major (Op. 8) on Clarinet Quartet No. 3 in D Major (Op. 7). Although the string parts are the same, rather than being a strick transcription, the Flute part often differs from the Clarinet part of Op. 7.